You say that Danish Dough is a laminated dough. What precisely does that mean? According to Baking911.com, "Laminated Dough" is made by encasing butter in dough, and taking it through a series of folds, rolling and turns to produce layers of butter in between sheets of dough. The leavening in these doughs is mainly derived from the steam generated by the moisture from the butter--the laminated fat traps water vapor and carbon dioxide formed during baking, and as steam expands in the oven, it lifts and separates the individual layers. One of the more famous types of laminated dough is Puff Pastry (which makes mille-fueilles), which rises solely on the steam and has a bit more butter; however, Danish dough, its close laminated cousin, gets an added lift (literally) from yeast. There are three basic laminated doughs: Puff pastry has no yeast, and is used to make yummy things like palmiers, cheese twists and any sort of super-flaky tart or crust. The dough itself isn't sweet, so it can be used for sweet or savory pastries. 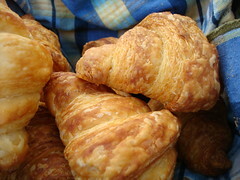 Croissant dough and danish dough are very similar, both containing yeast. But croissant doughs are considered very "lean" (crazy, I know) because the detrempe (which I just call "the doughy bit") has only flour, salt, water and yeast. Danish dough, however, is considered "rich" because it contains eggs and dairy, and sometimes sugar. In the recipe, there's a term called "détrempe". What is that? We think we figured it out though: détrempe refers to the dough part of the pastry, before the second part, the "beurrage"--the butter part--is added, which is what "laminates" it (in shiny buttery deliciousness). So...in layman's terms, what is the difference between Danish Dough and Puff Pastry (two of the laminated doughs cited above)? Puff Pastry has more butter and no yeast--the resulting pastry is flaky and melt-in-your-mouth buttery. Danish dough contains yeast, which we find gives it a slightly chewier and less flaky texture. 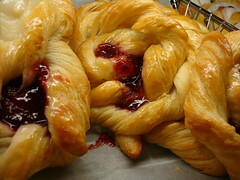 If they were to have a faceoff, which would win--puff pastry or danish dough? 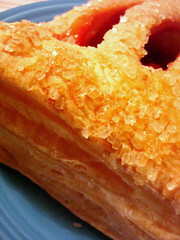 Really, would you ask us to choose between a flaky puff pastry or a delicious Danish? Apples and oranges, we tell you. Surely here's enough room in the world for all sorts of dough. 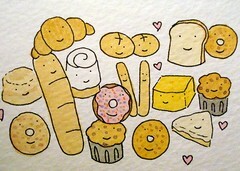 Vive le carbohydrate! 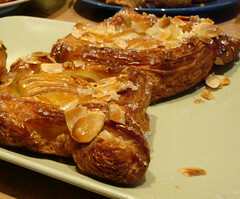 What are some examples of pastries made with Danish Dough? Well, the Danish, naturally--but pinwheels, envelopes and turnovers are frequently made using this type of dough. Also, though not always, a lot of kolache recipes call for a Danish-y dough. Whoa, sidebar: what's a kolache? According to Wikipedia, Kolache (also spelled kolace, kolach, or kolacky, from the Czech and Slovak plural koláče) are a type of pastry consisting of fillings ranging from fruits to cheeses inside a bread roll. Originally only a sweet dessert from Central Europe, they have become popular in parts of the United States (strangely, they seem to have a big concentration in the American midwest, with kolache havens occurring in Oklahoma and Texas, which both boast annual Kolache festivals; however, Montgomery MN cites itself as the "Kolacky Capital of the World". Fighting words, anyone?). 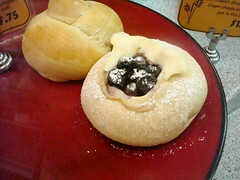 A picture of a kolache we found in Seattle at the Great Harvest Bread Company's Ballard location, is pictured left. Can puff pastry and Danish Dough be used interchangeably? We can't say for sure since we haven't tried, and really there would be nothing wrong with the flavor combinations per se--in fact, we've even seen Danish that has had the distinct look of puff pastry (see left, photo of a cream-and-fruit Danish from the Columbia City Bakery in Seattle). Will we be making this leap in the future though? 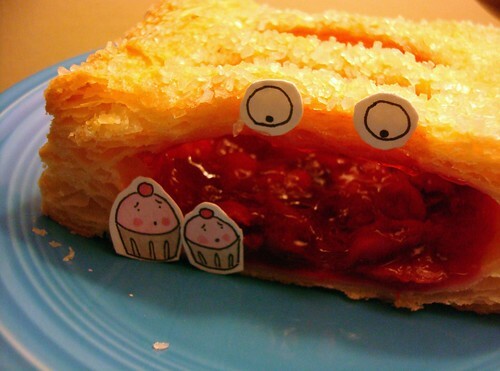 Don't look out for it--our fear of ruining a delicious recipe is too great. Though perhaps this just means we're pastry prudes who badly need to take a walk on the wild side. Why does it take so long to make my own dough? Well, they say that Rome wasn't built in a day, and similarly, good Danish Dough must not be rushed. While the waiting periods (a half hour here to chill, another half hour there) may seem fussy, we advise that you wait it out--the taste of your baked goods will reward you at the end. 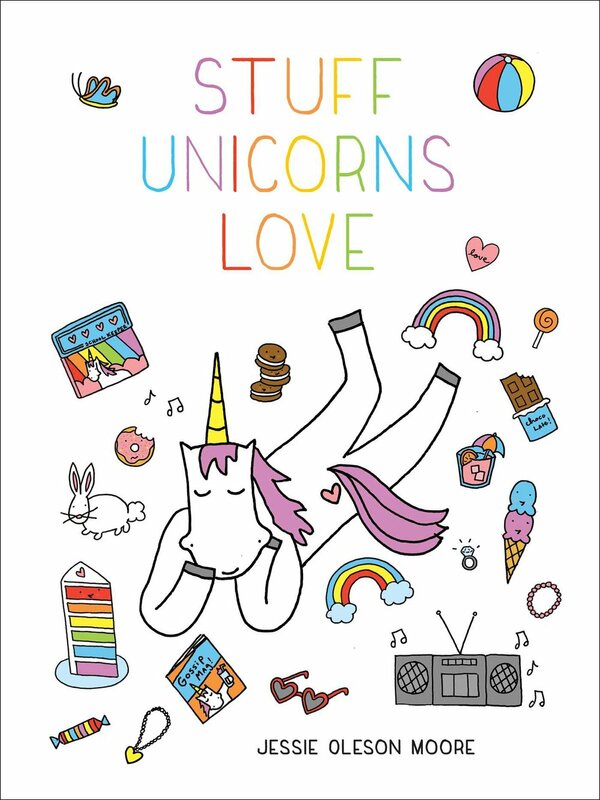 And plus, all of those waiting periods leave you so much time to find cool stuff on the internet or even to drop by the nearest bakery to pick up an appetizer sweet. Why are so many laminated doughs braided, slit or otherwise disfigured on top? Though this can add visual appeal, it is mainly to let excess steam out while baking. ...speaking of which, shouldn't you be checking on your Danish braid about now? (Several moments pass; we return to our questioning, with the slightest bit of sugary glaze and fruit filling still clinging around the corners of our mouths--see left). It's clear your mind is on other things now. So...where can I learn more about laminated doughs? Well, we recently saw a great show by Alton Brown explaining all about Puff Pastry (and boy is he cute! ), or you could also turn to puffpastry.com, a site operated by Pepperidge Farms which has recipes, forums and information on laminated doughs; for more information on all things laminated dough (both Puff Pastry and Danish Dough), also visit baking911.com! Postscript: The chewing resumes, the light dims, and yes--our spies realize that really and truly, homemade Danish Dough--especially when filled with fresh preserves (we chose cherry)--is a thing of beauty.